We started blogging last year around September or so, but back then we had more of a personal blog, not a book blog. Geeky Chiquitas became mainly a book blog around New Year. While we were celebrating, we kinda got the idea that becoming a book blog would be great. My favorite part about book blogging is meeting new friends. The book community is just awesome. We've interacted with authors bloggers and so many other bookish people all because of our book blog. They're all great and amazing and super friendly. They'll make new book bloggers feel right at home. Mostly we blog about YA, specifically contemporary. We actually read anything but it's just that we've had a lot of great reads in that genre lately. Of course, there are also a lot of books from other genres that we have also enjoyed as much as we enjoyed the books from contemporary YA. Basically, we blog about any book that we happen to want to blog about. It just so happens that those books mainly come from YA contemporary. My favorite book.. Ah that's hard! There's too many to choose from but classic favorite would really have to be the Harry Potter series. I can't seem to find any book that can top that. The best thing about book blogging that has happened to me.... Is that I got to interact with a lot of great and awesome authors that I wouldn't have had the chance to talk to if it weren't for book blogging. We never really thought that we would get to interact with authors. It's amazing how, now, we get to interact with them and it's all because of book blogging. When I get excited about a book, I usually pass it onto my parents and my husband. All three of them loved Grave Mercy by Robin LaFevers. My husband really liked the Mortal Instruments series. I recently gave City of Bones to my dad and he also liked it. My parents read The Fault In Our Stars; my dad liked it more than my mother. I gave Neverwhere to my dad and he really liked it. I got my parents and husband hooked on the Divergent books. And Hunger Games. Plus, I've shared a lot of the history and adult non-fiction that I love with my dad. Wow.. That's cool..My husband is interested in listening to the stories from me not reading them! LOL..
My husband tends to read magazines more than books. However, I have managed to coerce him into seeing the Twilight saga movies, The City of Bones and Divergent. Wow that's awesome! My family and I have different tastes. Although my sister did read Divergent on her own. Hasn't read the rest even though I bought her the rest! When my sister finished the Divergent series last month, I got rapid fire text messages from her. Grave Mercy has been on my to-read list for like 2 years! Thanks for stopping by Second Run Reviews yesterday, Alison. I never shared any of my books with my mom. She is just not going for it lol. I think it's pretty cool yours did. Thanks for dropping by my F&F. I love the Mortal Instruments series. My husband prefers biographies, but I can usually talk him into watching the movies with me. I've only read a couple of the Mortal Instruments but I did LOVE Grave Mercy. I can not imagine sharing any of my books with my parents....they just would not get into them. I usually share all my feelings on books with Kristen from My Bookish Fairytale. Her and I have become really good friends because of books. It is amazing how books can bring people together! It's so great that you have family that you can talk books with. No one in my family likes to read except me. I hear so much about Mortal Instruments and how good it is. May just have to check that out. 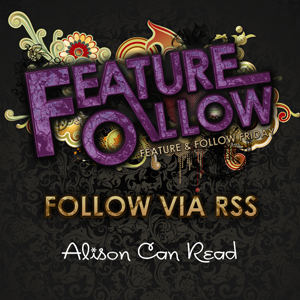 Thanks for stopping by my blog Alison. I'm an existing bloglovin follower. Sounds like you have a pretty big influence on the people around you! Unfortunately my sister obstinately refuses to read what I recommend, until she stumbles upon it herself and then falls in love with it! I mainly share my classics with my dad! :) Thanks for sharing and hosting! Hi Alison! Hope you had a great weekend.